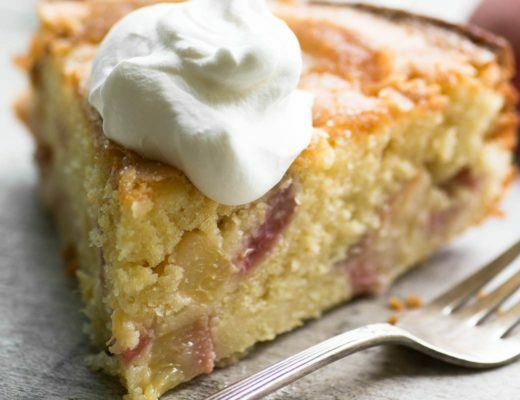 Plum Blitz Kuchen, or ‘lightning cake’ is a vintage German snacking cake recipe from the 1931 edition of Joy of Cooking. It’s a quick and easy, as the name suggests, and really delicious for breakfast, brunch, coffee break or anytime snacking. Customize it with almost any fruit you like. 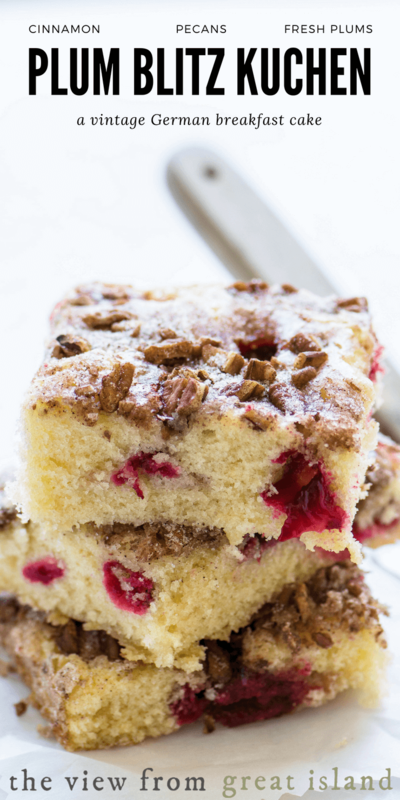 VINTAGE VIEW ~ this Plum Blitz Kuchen cake is from TVFGI archives, first published in 2011. 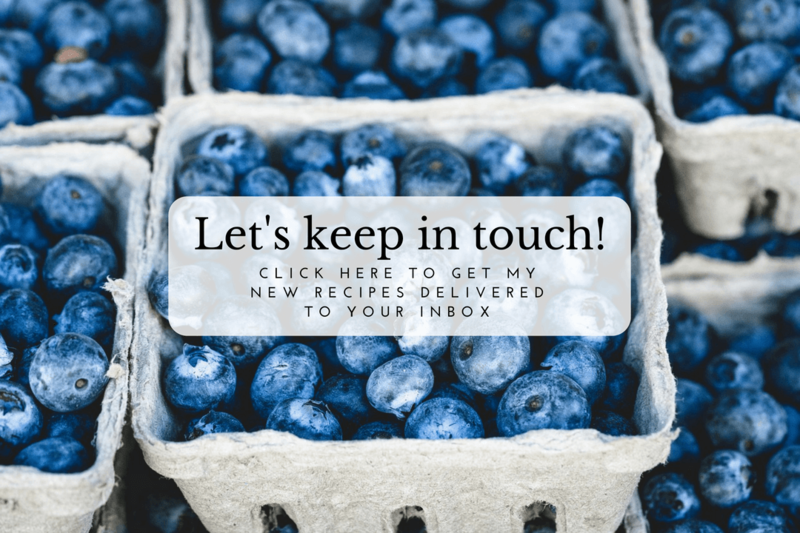 As part of a series on the blog I’m reviving some of the best recipes that you may have missed over the years ~ I’ve updated my notes and taken new photos. 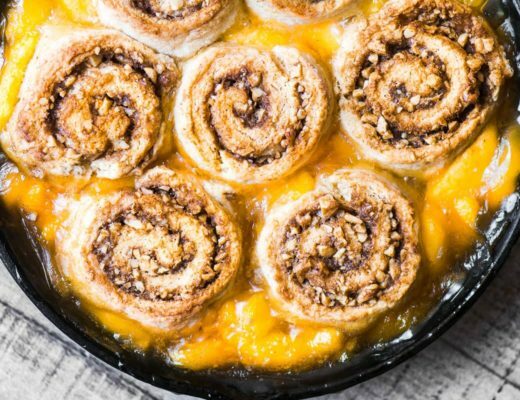 I’ve always been drawn to simple, depression era recipes and this one is typical of the times…simple, homey, and so delicious. I’m excited to bring this one out of the ‘vaults’ and into the light again! We owe so many of our baking traditions to early German immigrants who brought with them their love of baking cookies, pastries, and cakes of all kinds. Generations ago lots of Germans settled in the American midwest, and these kinds of baked treats are still hugely popular there. 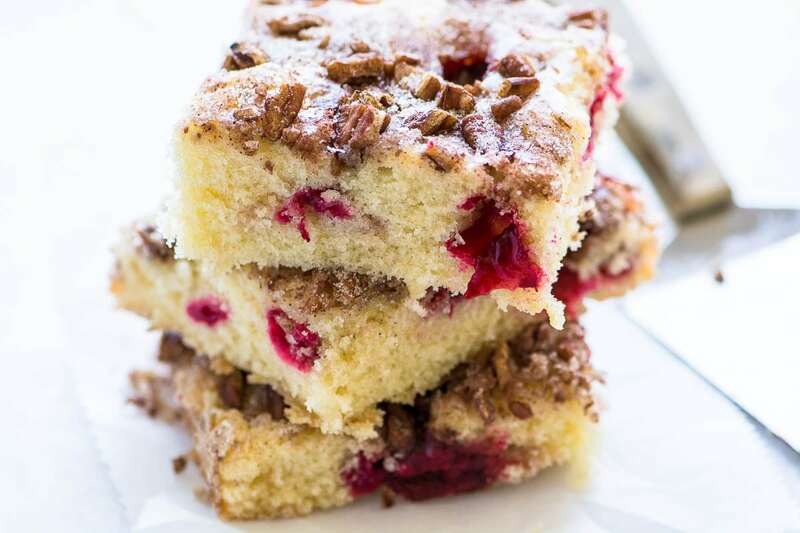 The kuchen is the official state dessert of South Dakota! I can remember my grandmother, who was a young housewife during the Depression, cooking this kind of quick cinnamon sugar cake when I was little…we loved it best when it was piping hot out of the oven when the cinnamon, sugar and butter topping that she scattered all over the top was still molten. This cake has that same simple, vintage feel to it that really appeals to me. I’ll bet during the depression this would have been quite a treat. 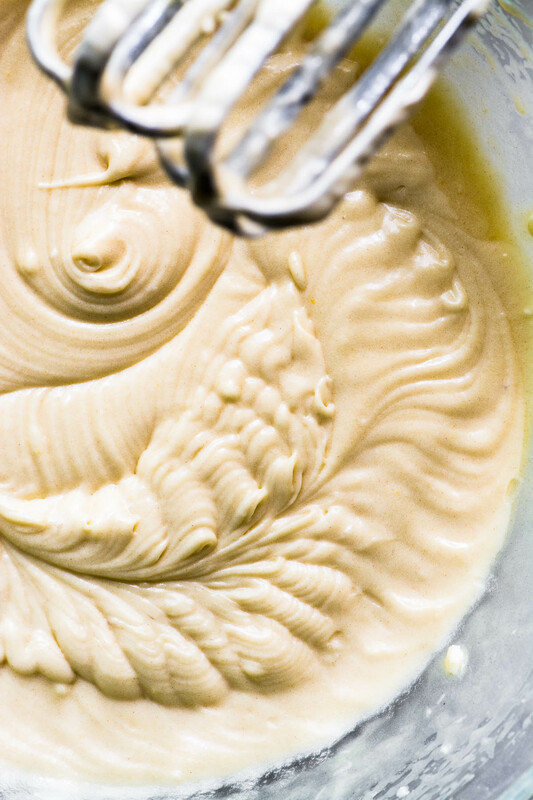 The batter is a breeze to whip up, it comes together quickly with electric beaters, or you could even use a whisk. It’s a nice thick batter so the fruit that I scatter on the top doesn’t sink straight to the bottom. So many different types of fruit would work in this cake. I chose gorgeous black plums that I picked up at my farmers market, but apricots, peaches, bananas, etc, would all work. Apples and pears would also be delicious, so keep them in mind for the fall season. Just don’t be tempted to over do it ~ too much juicy fruit will make the cake soggy. 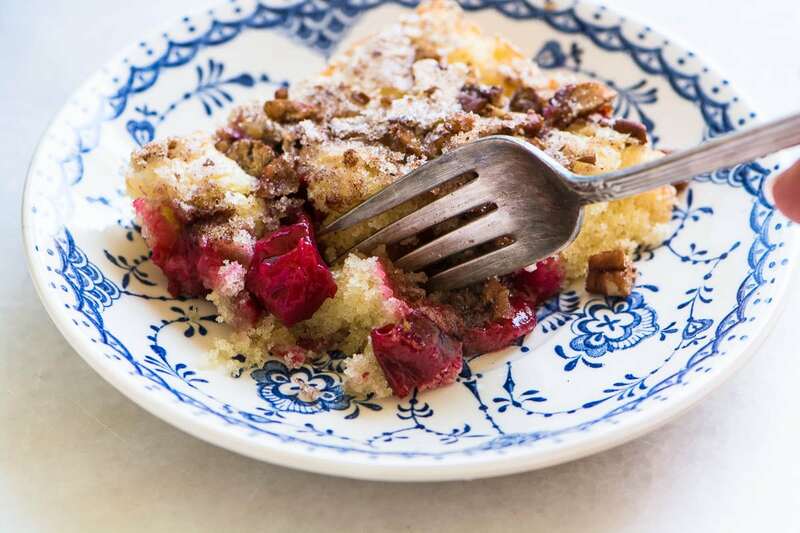 This easy little breakfast cake is a delight ~ the perfect thing to rouse sleepy houseguests, or treat the family to on a weekend morning. It bakes up in a mere 25 minutes ~ just when you begin to smell the cinnamon-y aroma, it’s done. Mix the topping ingredients in a small bowl and set aside. In a large mixing bowl whisk together the flour, sugar, baking powder, and salt. Beat in the eggs, milk, and vanilla for 2 minutes, then beat in the softened butter. Spread the batter in the prepared pan, and then top evenly with the cut plums. Sprinkle the sugar and nut topping evenly over everything. Bake for 20-28 minutes or until a toothpick comes out clean. Check on the early side, you don't want to over bake this cake. Make it with different fruit, as noted above, try other stone fruit, or apples or pears. Make it richer ~ dot the top with butter before baking. You can also use half and half instead of milk. Make it non-dairy ~ use almond or coconut milk. Make it with a mix ~ it occurred to me that this cake could easily be made with a cake mix as the base…talk about lightning fast! I’m fascinated by Depression era recipes, are you? When circumstances are tough and times are lean, creative cooks come up with some amazing ideas. My Best Ever Vegan Chocolate Cake is made without butter or eggs, but it’s one of my favorite cakes, who knew? And what about Creamed Peas on Toast? Mashed Potato Cakes? Or Fried Cabbage with Bacon? All good stuff! As usual, I’m going to try to convert it to gluten free. If anyone has any luck with that, please let me know. 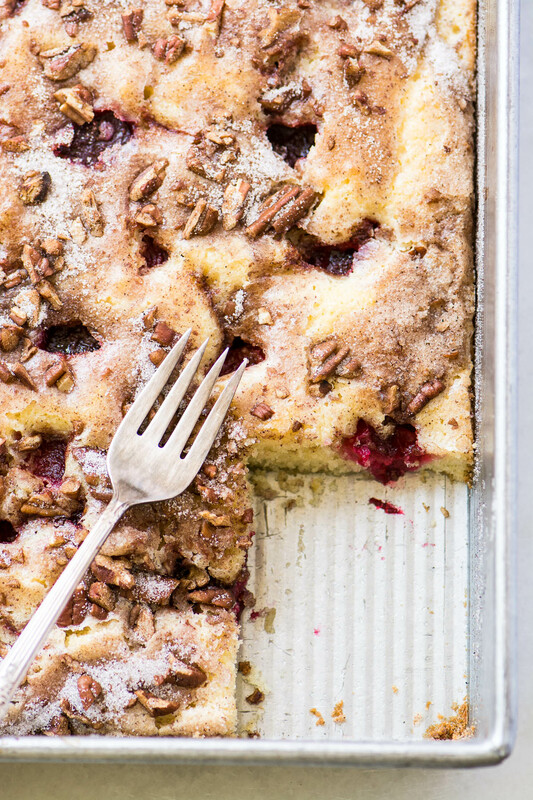 There is a classic plum cake recipe that has been printed in the New York Times periodically. I believe it was either Florence Fabricant or Marian Burros and they called it the original plum torte. People begged the newspaper to print it every year. It’s not as cakey as yours, but I like cakey! You might want to look at it, just fyi. 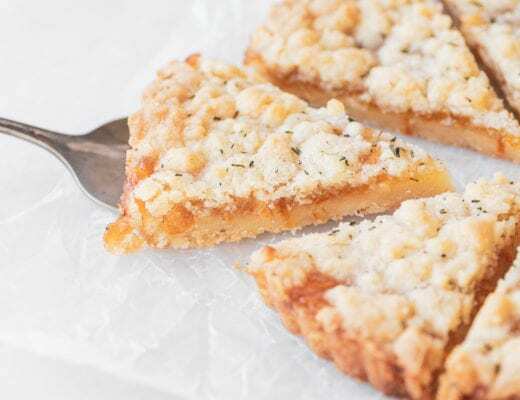 I grew up on kuchen and have never found one I didn’t love. This one is new to me and I can’t wait to try it! It looks so yummy with those sweet juicy plums! 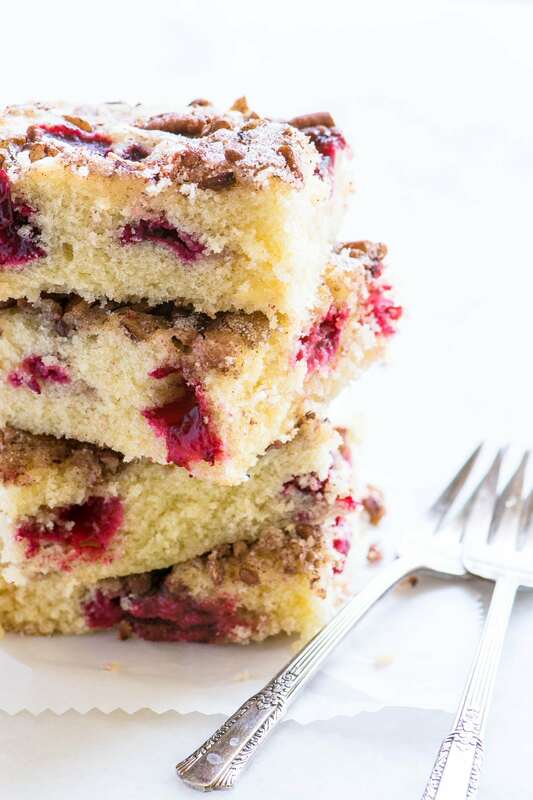 Those pockets of plum deliciousness, that gorgeous sugary top, the wonderful texture – all reasons I need to make this ASAP! I don’t think I could say that three times fast, but it looks absolutely delicious! You probably can gather how I feel about plums. And I love the idea of this in muffin form. ;) Sounds like a great dog days of summer dessert! I’m a Joy of Cooking girl myself, second generation. My first copy fell completely apart so I found a pristine copy at a yard sale that had been a wedding gift for some couple who were way too cool for it. I think of my mother when I use it…and it answers any question, about any cuisine, about any cut of meat or any sauce or any whatever. What a beautiful tribute to Irma S. Rombauer – love that you chose a classic recipe and added your own twist with fresh fruit. Mmm! This cake is surely a wonderful homage to Irma’s German roots! Looks so moist and gooey! I do love a crumbly fruity cake with a hot cuppa Joe! This cake looks simple and tasty – were you pleased with the results despite the confectioner’s sugar not fully incorporating? 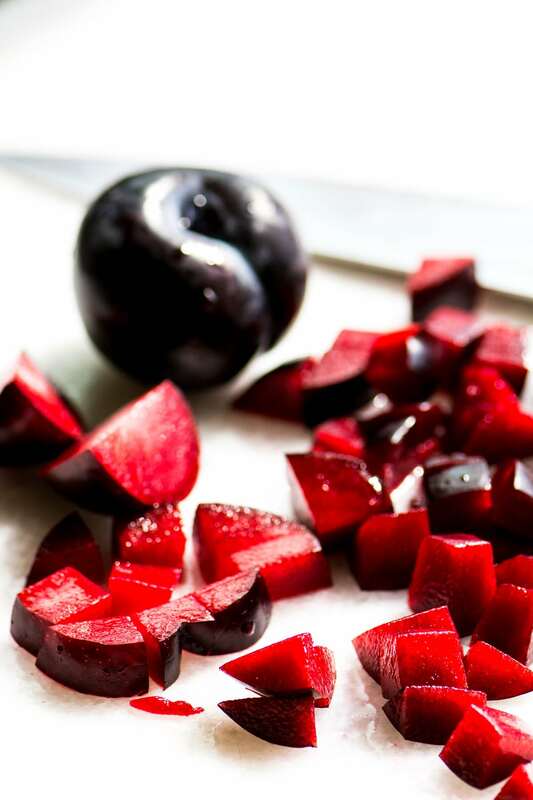 It reminds me a little of the plum crisp in one of the Barefoot Contessa books. I have a reprint of “The Joy of Cooking”. Although I know it is a kitchen standby, I have had rather mixed results with the recipes in there. ‘The Joy of Cooking’ was until now completely unknown to us and we are unsure whether or not Irma Rombauer was ever published in the UK. It all sounds most fascinating and is of interest to see the changes in eating habits over a period of time which books, such as this, illustrate. 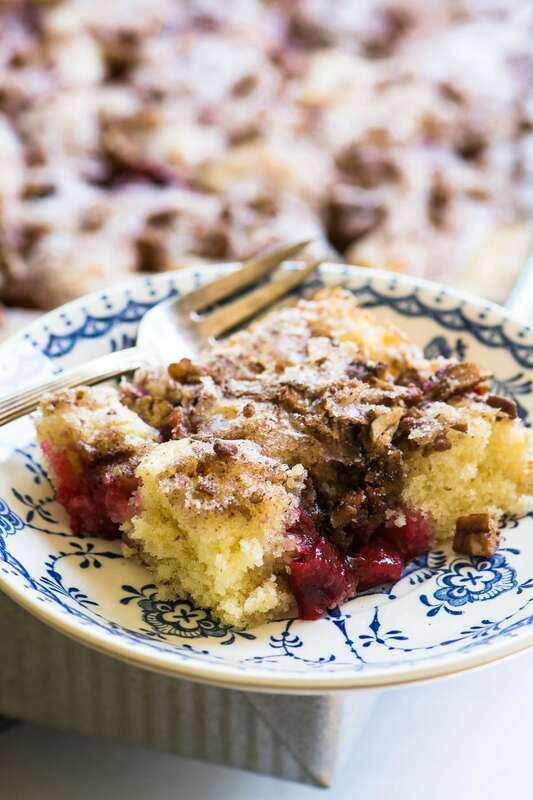 Love the addition of the plums in there – I’d say it was heavenly with a mug of coffee. What a nice post, Sue! I am sorry I just cldn’t do anything this week but will hopefully be back next time. Glad you liked my Ali Nazik!! A far cry from Joy of Cooking! !